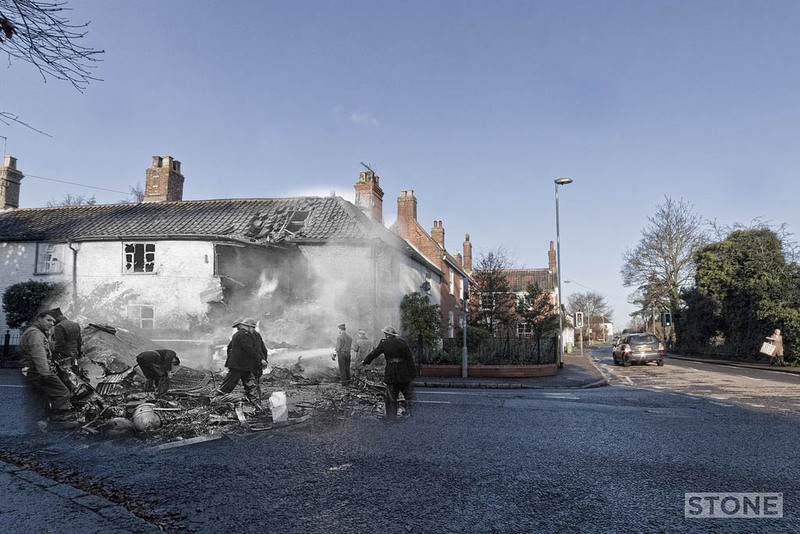 This was the scene in Catton at the corner of Church Street and Spixworth Road on the 13th February 1945 and the corner of the same Roads on 22nd December 2011. The Liberator ‘A Dog’s Life’ was one of two that crashed in Catton on the outskirts of Norwich, The other Tommie Thumper II was probably only about 200ft away in Catton deer park, just in the edge of the trees. There are various others too, including one that clipped a church and ended up upside down on city stations yard near Heigham Street, and another that flopped into the council estate behind the Boundary pub. There’s also two Brit planes in Mousehold, one a Beaufighter With a mixed crew of Anzacs and Brits, and a Polish Spitfire in Maurice Raes Close off the Sprowston Road, the road is named after him. This was a B-24 Liberator in the 2nd Air Division 458th heavy bomb group, 753rd bomber squadron, aircraft serial number was 44-40281 stationed at RAF Horsham St Faiths. The crash was due to an engine failure on takeoff, the plane turned over Catton Park to land back at what is now Norwich Airport and didn’t make it. But did that valiant “try not to hit anything that looks like a house” thing that pilots have a habit of trying to do” Who can imagine what must go through your head. 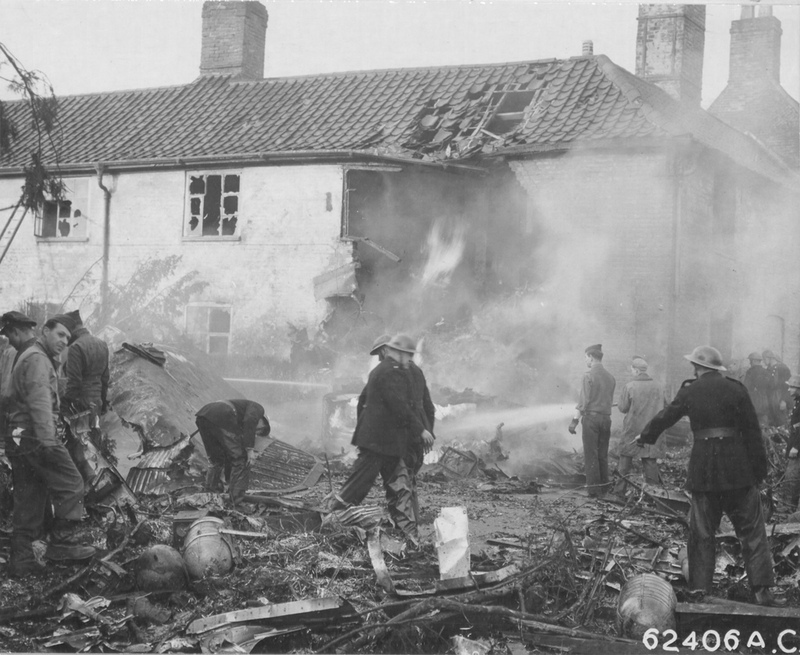 The only civilian hurt was the occupant of the house who survived. Incidentally the house is I believe where Anna Sewell, the writer of Black Beauty once lived, that is of course another story. The crew all died, one man survived simply by virtue of not being on the Liberator as he normally would have been, imagine that, losing all your mates in one hit, imagine how very very common that must have been, then think on about these boys, because that’s basically what they all were. Those cylinders by the way, they’re for oxygen, not bombs I don’t think anyone would be hanging about if they were, mind you oxygen and fire isn’t exactly tidy either. The crew were: 2nd Lt. Lawrence R. Shannon – Pilot (O-719769) of Missouri, buried in Hillcrest Cemetery in Mountain Grove, MO. 2nd Lt. Allen K. Jewett – Co-Pilot (O-928696) of Colorado. F/O Leslie J. Gruner – Navigator (T-131834) of Illinois. Sgt. Robert L. Ward – Engineer (34776546) of North Carolina. Sgt. William L. Weber – Radio Oper. (17166654), Kansas. Sgt. Frederick M. Caudell – Gunner (34674937), North Carolina. Sgt. Charles E. Given, Jr. – Gunner (35655818) of West Virginia, buried in Given Cemetery in Elkview, West Virginia. Sgt. Gene P. Hamilton – Gunner (39136367) of California, buried in Lula Cemetery in Lula, Oklahoma. Sgt. Grant D. Ordiway – Gunner (33407044) of Pennsylvania, buried in Clarion Cemetery in Clarion, Pennsylvania.